Yes, you're reading correctly. Armin van Buuren & Deadmau5 have come together to produce a track! As you can hear from the preview this is legit and is definitely taking place. It came about from Deadmau5 thanking Armin for playing one of his tracks off his new album, and as a result of some people responding to these tweets with suggestions saying that Deadmau5 and Armin should come together for a track, they did just that. You can follow their progress of the ID that they are producing by just looking at their tweets. This is set to be a great production due to both of them being incredible producers and Armin having just picked up the title of best DJ in the world. You can already hear from the preview the contrast between Armin's and Deadmau5's completely different styles of production but the two seem to fit hand in hand with one another and I am greatly looking forward to this release! 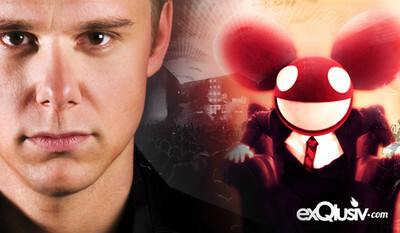 0 Respones to "Preview: Armin van Buuren & Deadmau5 - ID"